If you happen to be in Montreal this week, drop by the Galerie B-312 where composer and sound artist Adam Basanta has installed a series of works that play with self-generating microphone feedback. 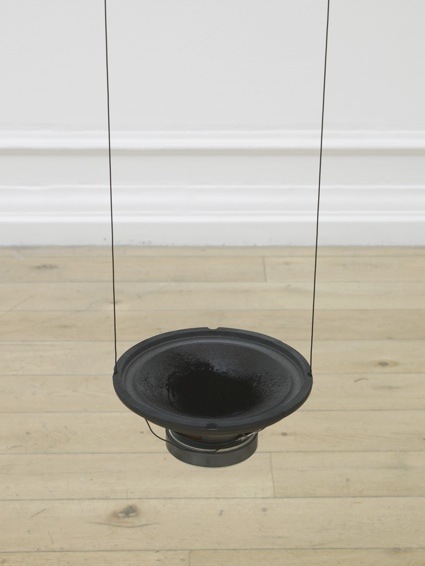 Each of the 3 works in the gallery examines, in its own witty and transparent way, the idea of sound as a mutable product of interdependent networks of physical, cultural and economic relations. 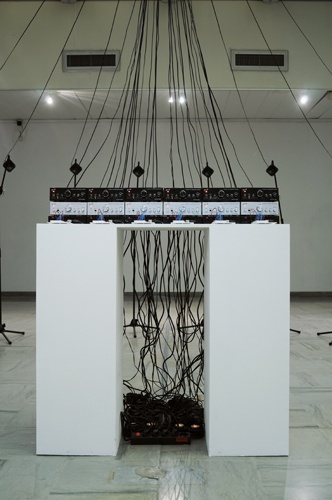 Amplifying and aestheticizing the acoustic inactivity between technological “inputs” and “outputs” – stand-ins for their corporeal correlates, the ear and mouth – the notion of a causal sound producing object is challenged, and questions are posed as to the status of the ʻamplifiedʼ. By building flawed technological systems and nullifying their intended potential for communication, the ear is turned towards the empty space between components; to the unique configurations of each amplifying assemblage. In The loudest sound in the room experienced very quietly, a feedback loop between microphone, PA system amplifier, and speaker cone is enclosed within a soundproof aquarium. The sound level within the enclosure reaches an ear-damaging 120dB, approximately the loudness of a car horn at close distance. 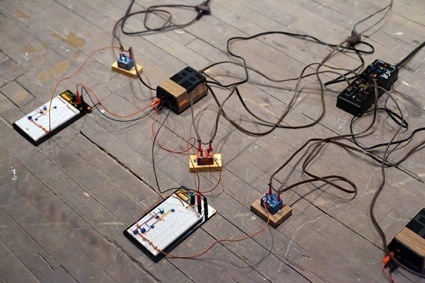 Pirouette further explores the notion of amplification systems as self-generating sound producers. A microphone rotates slowly and triggers a tuned feedback melody as it comes nearer to one of the seven speaker cones. It takes nine full rotations of the microphone to reveal a skeletal version of the main theme from Tchaikovsky’s Swan Lake ballet. 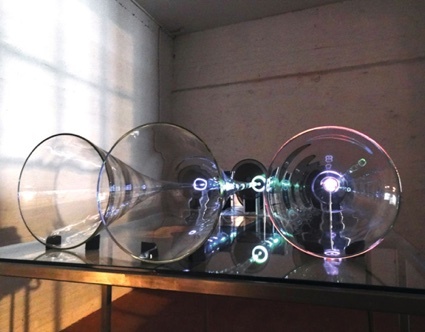 In the third work in the series, Vessel, the naturally resonant acoustic properties of a large glass jar are amplified, creating a feedback monody by varying the distance between speaker and microphone. 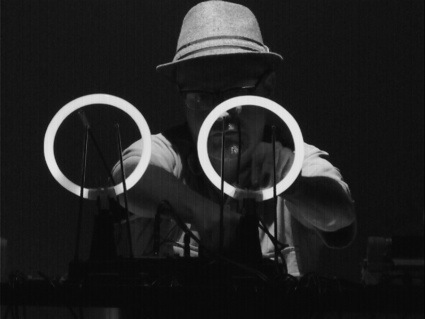 How could i resist the temptation to interview an artist who can not only turn the usually unpleasant microphone feedback into beautiful artifacts but whose past projects also include a performance in which he played Music for Lamps. Hi Adam! Could you give more details about Pirouette? How does it work exactly? In Pirouette, a microphone standing on a raised platform spins slowly, hovering over 7 suspended speaker cones. As the microphone hovers over each speaker, it enables a feedback loop: the microphone “hears” the speaker amplifying the microphone, and on and on until we hear microphone feedback or Larsen tones. Usually, this type of feedback would be very loud. But in Pirouette, the feedback is tuned and controlled by computer algorithms to create a slowly evolving feedback melody. A custom made software is inserted between the microphone and speakers, filtering out all but a very narrow range of audible frequencies. The frequencies which are allowed to “pass through” the filter are the ones that end up feeding back. In this way, I was able to create a very precise sequence of tonal pitches – the main theme from Tchaikovsky’s Swan Lake ballet – using feedback. As well, the computer algorithms control the overall volume and amplitude envelope of each feedback note. As the microphone hovers over a particular speaker, the gain of the channel is adjusted based on how loud the particular feedback note is: if it gets too loud, the computer brings down the gain while if it is too quiet, the computer will compensate the gain and make it a little louder. The description of The Sound of Empty Space talks about ‘building flawed technological systems’. Can you talk about these flaws? What makes them interesting and how did you exploit their potential? Well, the flaws are found in the ways I use or rearrange elements of commercial sound technologies. Pointing a microphone directly at a speaker is a basic error, the first thing you learn to avoid if you are working with amplified sound in whatever context. It is a flawed use of the equipment, in the sense that normally you would want the system to amplify something “worthwhile” (a musician, a speech etc). When feedback occurs, it makes the entire sound reinforecement system useless, because it is at its very basis a method to communicate information, and feedback nullifies this potential; it ‘jams’ the system, it is noise, it doesn’t allow “sanctioned” sounds to be amplified. So why do this in the first place? Well, I’ve been involved in making music in different contexts since I was about 12. As much as this is a fun thing to be involved in, I’ve come to realize that it is a huge industry – I like to call it the industry of ‘self expression’ – complete with industry magazines, blogs, and allegiances to this company or the other and whichever ‘lifestyle’ they are selling. I really dislike “gear-culture”, but at the same time these are still very much my artistic tools, both personally and culturally: just like a folk singer has a guitar, I have microphones and amplifiers and speakers. So in a way, arranging these elements in a flawed way – in a way that goes against the original commercial intent of the object – is my way of remaining creative with tools that are in many ways designed in a way which often limits creativity. I try to do this in a very non-antagonistic way: I’m not really interested in a grand rebellious gesture, but more in a gentler form of perversion. I am trying to make something beautiful, something that people can get lost listening to, out of this flaw or error. At the same time, the more I think about feedback and the more I work with it as sonic material, the more I find it fascinating conceptually. It is an emergent phenomena, in that it relies on the configuration of microphone, speaker and acoustic environment. It reveals aural dimensions of architecture to which we don’t have easy (visual) access to. There is no real “causal” element in the feedback chain – all the components are “passive” sort to speak – you can’t really say that the speaker is producing the sound more than the microphone is. And in a sense, this is a really beautiful and powerful metaphor for listening in general: perceiving the sound of a guitar or a bird or your lover’s voice has as much to do with one’s own physiological or psychophysical attributes (for instance, the length of the auditory canal), one’s intention (am I hearing or listening? ), and the general context in which the sound is produced. You are a composer and sound artist. Yet, your installation have obvious aesthetically qualities. Could you talk to us about the visual aspect of your work? Is it important to you? Does it complement the sound work? Although my training is in sound and music, and I was never really involved in visual art, the visual aspect of these works is critical for me. As opposed to sound, which evolves in time, visual impressions are immediate, so it is really the way to get people curious about the work. With that in mind, I try to use a visual vocabulary that creates a mix of transparency and mystery. Transparency in the sense that I present my materials – microphones, speakers, amplifiers, cables – in a very matter of fact way: here they are, here is how they are connected together. At the same time, some elements are hidden – often, this involves the computer – and so even though we see these recognizable materials there is a sense of mystery or surprise with regard to the qualities of the sounds, or exactly how they are being produced. With this exhibition in particular, I’ve been very interested in combining visual and sonic materials in a way that creates an intertwined web of references, and in this way create richer listening situation. The use of microphones, speakers and public address amplifiers – objects that embody communication and sound reproduction technologies – are obvious examples of this. Subtler references include Vessel‘s resemblance to an “impossible bottle / ship in a bottle”, as well as Pirouette‘s visual reference to a rotating music-box ballerina coupled with the aural reference to Tchaikovsky’s Swan Lake. Even small details, such as the use of 7 speakers in Pirouette, reference the 7 tone scale in Western harmony. Of course, not all of these will be picked up by visitors, and the works can be enjoyed on a “purely aural” level (if that even exists). But to me this is the biggest impetus to create sound art (as a separate practice from concert music): the potential to combine visual references, conceptual ideas, and sonic material (in all its richness and wordless intoxication) in order to create some sort of hybrid listening experience. We live in a very visual society. And sound art is often reduced to just music. I also often find that art journalists, bloggers and critics (apart from those who specialize in sound art of course) are a bit at loss when it comes to writing about sound art. Do you feel that sound artists have a disadvantage compared to visual artists? I suppose so. It certainly is a more marginal practice in terms of number of practitioners and institutions, and general ‘visibility’. Of course, it also has less commercial potential because it tends to subvert the idea of an art object in favour of an in-situ experience. At the same time, I feel people respond strongly to sound art for precisely these reasons, so I suppose there are two sides to the coin. At the moment, I am hard at work writing some new chamber music pieces for instruments and live electronics, to be performed by Montreal-based ensembles Magnitude6 and Architek Percussion. In terms of sound art installations, I’m continuing to develop some of the threads evident in The sound of empty space, although with some subtle variations. In June, I will create a site-specific feedback installation for the Centre for Contemporary Arts in Santa Fe, NM, which will explore ideas of feedback as indicator of physical acoustic space in a very large spatial setting. This fall I will be in residency at Titanik Gallery in Turku, Finland, where I will work towards a new exhibition at the Gallery in the end of October 2015, which will examine relationships between instruments of mass communication, the materiality of communication signals, and subjectivities of listening. The sound of empty space is at the Galerie B-312 in Montreal until 21 March 2015. Music for Lamps will be playing at MATA Festival at The Kitchen in New York on 15th April.